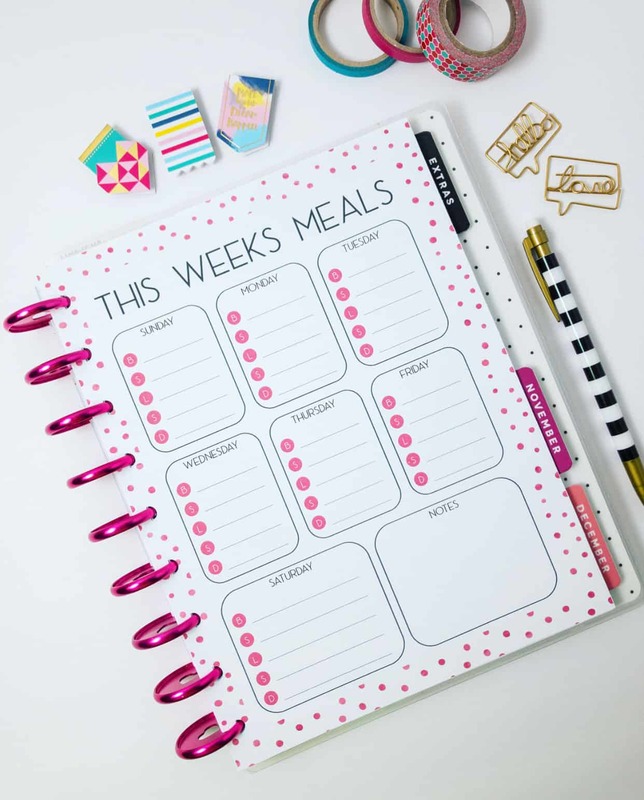 Do you want to organize your home but don’t have a huge budget? Guess what! You totally don’t have to! 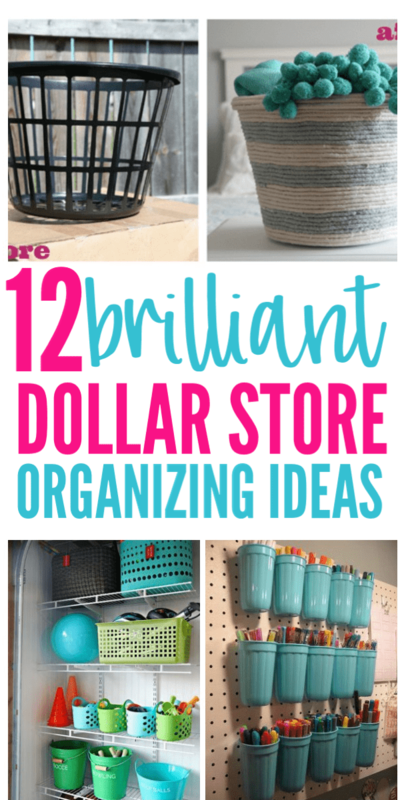 There are so many baskets and bins you can find at the Dollar Store to organize every room in your house! We found so many great ideas for you to organize your home and give you extra storage! Check out all these great ideas below! 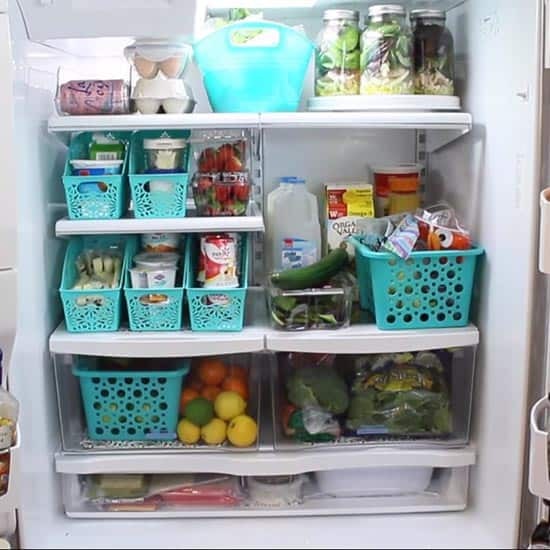 The dollar store has cheap bins you can use to organize your fridge. Most of the time they have a lot of colors and sizes to choose from. 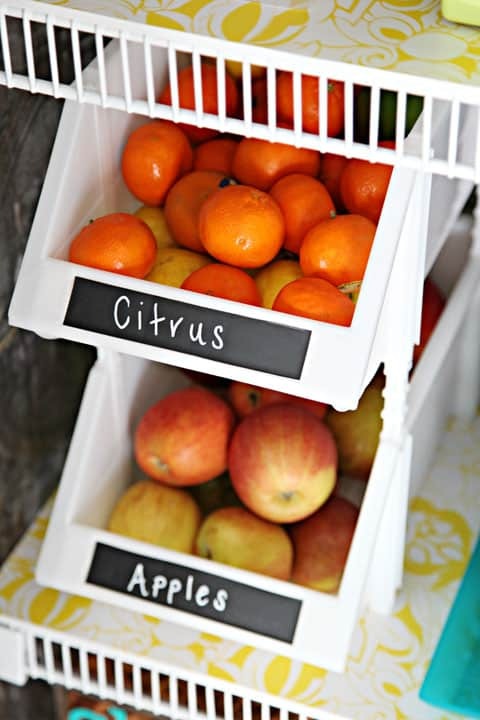 You could store snacks, yogurts, fruits & vegetables, and dairy products all in separate bins. Give your pantry a makeover by using stackable bins from the Dollar Store. You can even get chalkboard labels or make your own labels! 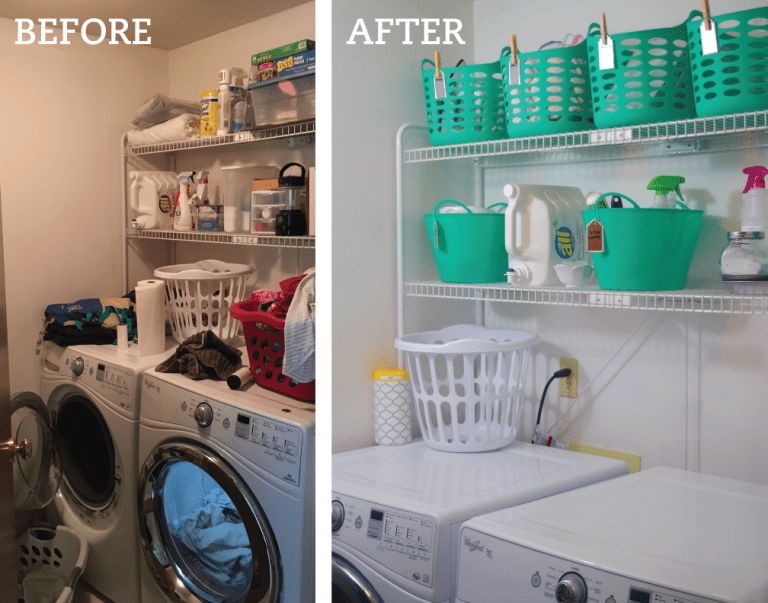 Look how Nikki Jayne Papery organized her laundry room with dollar store baskets! She added a pretty pop of color and was able to organize her space and rid her laundry room of clutter. 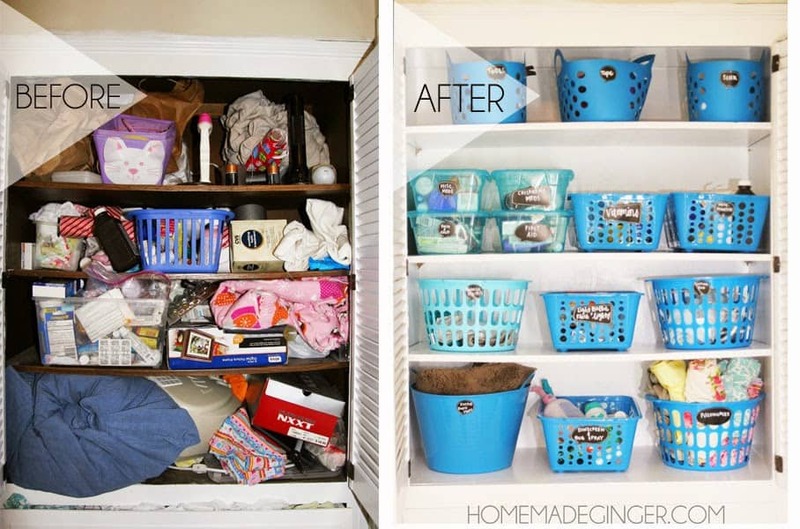 This is such a cheap and easy way to organize your laundry room! If your linen closet is a wreck, using dollar store baskets and bins is a great way to declutter and organize. You can use baskets and labels to sort everything you have into categories! 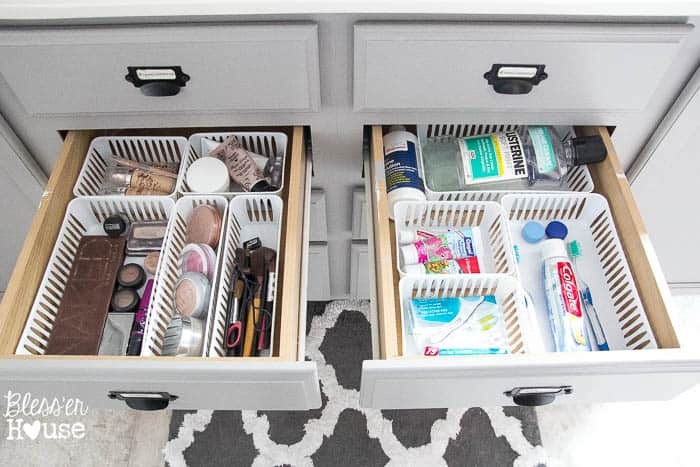 If your bathroom drawers are a mess this is a great way to organize them! You can get different size bins from the dollars store and arrange them in your bathroom drawers. It is a great way to keep your drawers protected and clean from spills and dirt! 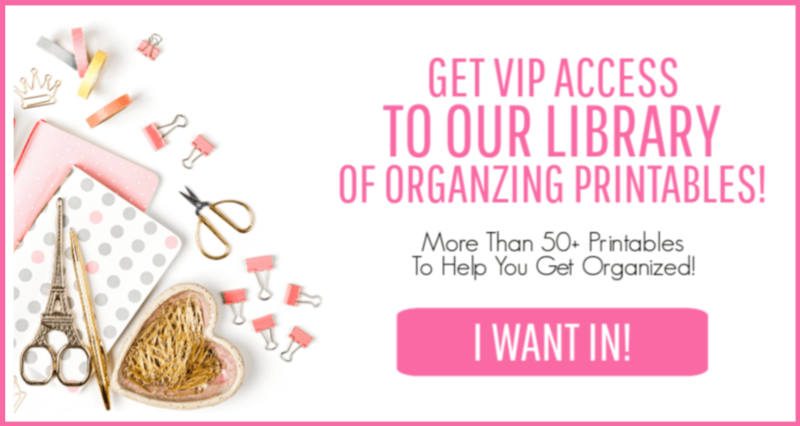 Plus you will look like an organizing professional! 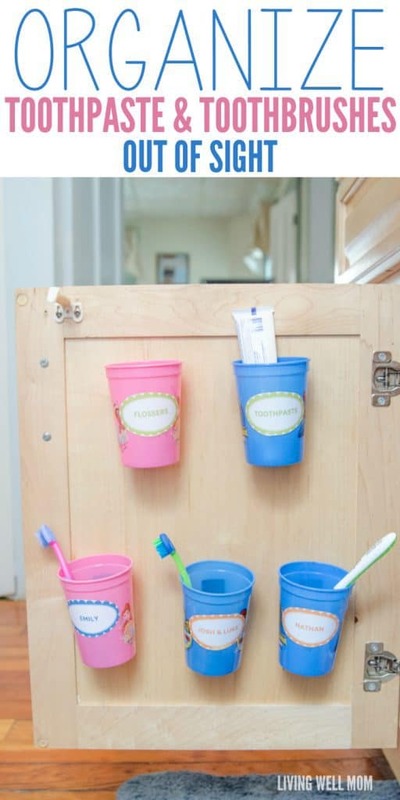 Attaching plastic cups to your bathroom cabinet door is a great way to organize your kid’s toothbrush and toothpaste. Each child can have their own cup and special place to store their toothbrush! Chose their favorite color and add a pretty waterproof label with their name on it! 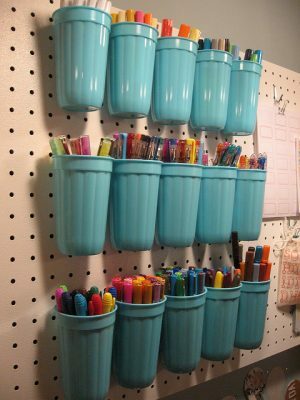 Attaching plastic cups to a pegboard is a brilliant way to store pens, markers, pencils, scissors, etc. The Dollar Store has so many options that you could choose any color to match your space! Isn’t this a neat idea? You can take cheap dollar store bins and spray paint them to make them look vintage. 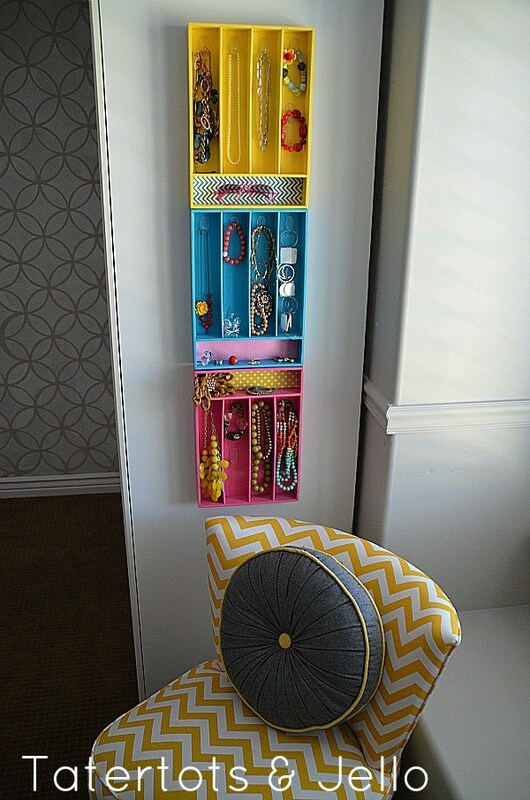 This is a great way to decorate and organize any space in your home! 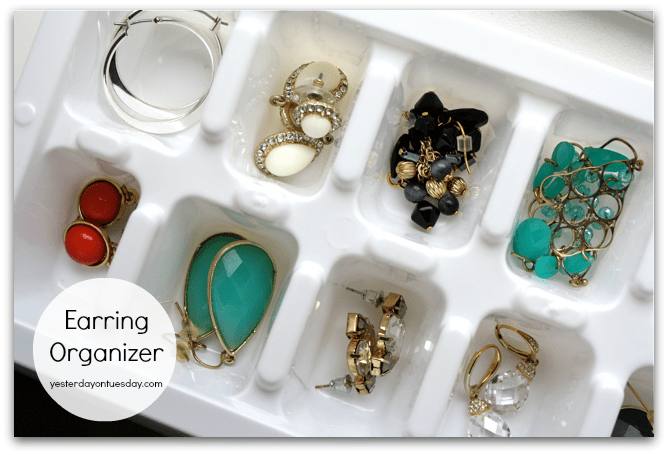 Using an ice cube tray is a brilliant way to organize your earrings. Most are small enough that they will fit perfectly in each cube. You can slide them into a dresser or bathroom drawer to create the perfect jewelry organizer. Plus they are stackable for extra storage! You can use cheap utensil trays to organize your jewelry! Sometimes the Dollar Stores will have them in a variety of colors but if not you could always spray paint them whatever color you want! Use a little bit of cardstock to add pretty patterns and command hooks to hang necklaces and bracelets! 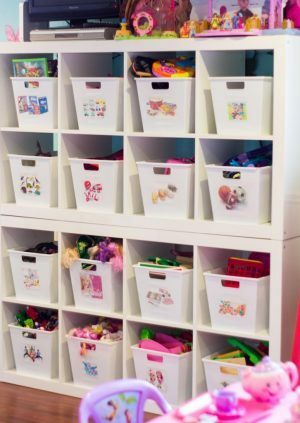 Using a cube storage system and plastic bins from the dollar tree is a great way to organize and store your kid’s toys. Having everything organized will keep their toy room clean plus it is a great way to teach your kids how to be clean and tidy. 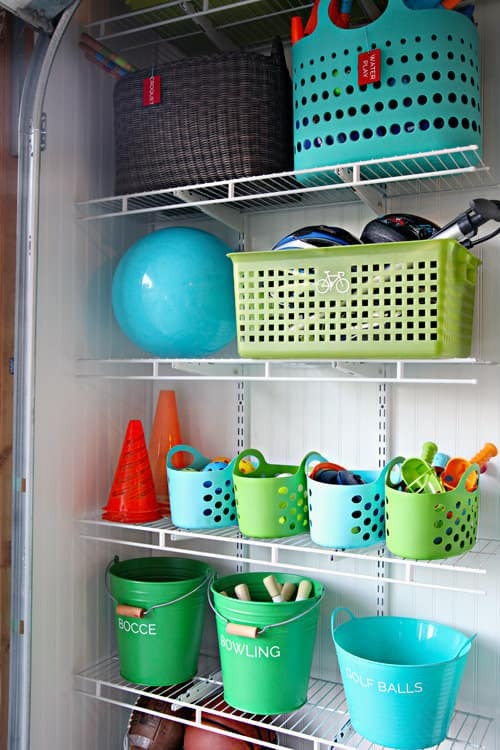 Using bins and baskets in your garage is a great way to organize toys. You can have a bin for balls, sand toys, water toys, etc. So did these ideas want to make you run out to the Dollar Store right now and start organizing every room of your house? I hope so! 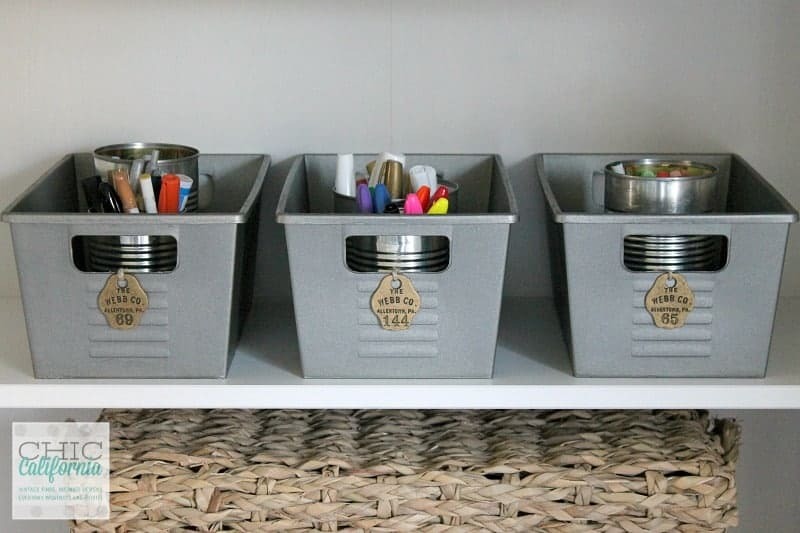 Comment below on ways you have used Dollar Store bins & baskets to organize your home!